A Boston fire wagon without its horses. Australia’s equine flu outbreak of 2007 may have crippled the racing industry, but an 1872 outbreak in North America brought the entire US economy to a virtual standstill. Horses powered the economy and the outbreak, which became known as the Great Epizootic, swept across the nation like wildfire. Official estimates put the number of affected horses at between 80% and 99%. Ports and transportation came to a standstill. Firemen were reduced to pulling their own fire tenders. Locomotives also came to a halt as coal could not be delivered to power them. Even the US Cavalry was reduced to fighting the Apaches on foot, who likewise found their mounts too sick to do battle. The Great Epizootic was first noticed near Toronto, Canada, and in 90 days had spread across the continent. It spread down the Atlantic seaboard to Havana, Cuba, leaving everything in its path in ruins in weeks, while another branch raced west to the Pacific. A later report suggested a mortality rate of 1% to 2%, although in some areas up to 10% of horses were said to have died from the disease. Philadelphia reported the loss of 2500 horses. The news was no better the next day: “Alarming Effect upon the People, Total Suspension of Travel, Disappearance of Wagons,” the newspaper headlined its coverage. By November 1, the Times was discussing the likely cost of the epidemic. Much of the information available today about the outbreak is due to a three-year research project undertaken by the The Long Riders’ Guild Academic Foundation. Guild founder CuChullaine O’Reilly said the Great Epizootic was the worst equestrian catastrophe in the history of the United States – and perhaps the world. One of the major casualties of the Great Epizootic was the city of Boston itself. A great fire swept through the industrial section on November 9, ultimately destroying 26 hectares of the city, comprising 776 buildings. The area of the city had many wooden-roofed buildings storing flammable materials, and its water supply was notoriously bad. The original six-inch water-pipe reticulation had been adequate for hand-operated pumps, but could not keep up an adequate supply to the powerful steam-driven pumps operated by the Boston Fire Department at the time. Furthermore, the pipe had rusted down to just five inches in diameter. However, in the days before the outbreak the powerful horses used to pull the steam-driven pumps had been stricken by the flu. 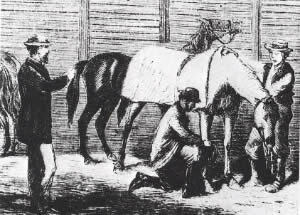 Many animals were unable to stand in their stalls – a common symptom among many of the horses affected across the country. The citizens of Boston had to be called upon to haul the pumps through the streets by hand, losing crucial time as the fire took hold in a warehouse holding cotton goods. “This was a job they did not relish,” the guild noted of the men who pulled the wagons, “not only because of its great tax on their physical strength, but because the long columns of men with the hose lines clattering at their heels were greeted with jeers, jibes, and laughter whenever they appeared on the crowded streets. A flu-striken horse is treated by blistering. Delays getting pumps to the scene were crucial, but the feeble water pressure greeting firefighters compounded the disaster. The official American government report on the Equine Influenza Epidemic was prepared by Dr James Law, a Scotsman by birth and a graduate of Edinburgh’s Royal Veterinarian College. Dr Law detailed the remarkable spread of the disease, apparently from horses at pasture near Toronto. Professor A. Smith, a Toronto veterinary surgeon, reported that the first cases occurred in the townships of York, Scarboro, and Markham. Cases were seen in Toronto by October 1, and in three days it had attacked nearly all the horses at livery stables and those that pulled the street cars. On October 18 it was reported as widespread in Montreal and Quebec and throughout Canada. Several Canadian horses arrived at Detroit on October 10 or 11, reportedly suffering flu-like symptoms. From there, it spread across the US. “The majority of the reports testify that animals at grass in mild weather were later in being attacked, and suffered less than those in regular work and stabled,” Dr Law wrote. He put the fatality rate 1% to 2% on a general average, “though it has been considerably higher than this in some of the larger cities”. Noted veterinarian historian, Brigadier General Dr Thomas Murnane, told the guild that the spread of equine influenza from Canada, through the majority of the United States and into the Caribbean, was remarkable. In the absence of the real thing, men resorted to shanks’s pony to pull a wagon. “The disease moved from animal to animal and through some residual contact such as public water troughs. Horses were moved by railcars in that era but otherwise the perpetuation of the disease was dependent on movement of horses. “Today, current transport of horses by automobile trailers or vans and aircraft enables rapid dissemination of diseases. “How else would a disease move from Japan, quickly, without suspicion of illness, other than through air transport?” he said in response to the apparent source of the current Australian outbreak being an infected Japanese stallion. The population of horses 135 years ago was very distinct from today, he said. “Then, there were urban horses engaged in the transport of humans and goods. “Now animals are not congregated in urban areas for transport of humans or materials. Rather they are congregated for racing and other sporting events like rodeos and horse shows. Horsetalk extends its thanks to the Long Riders Guild Academic Foundation for it assistance with this report, which was first published on Horsetalk.co.nz on September 25, 2007.A summary of The Long Riders Guild Academic Foundation’s material on the outbreak can be found here. The LRGAF collection includes a hitherto “lost” 19th Century governmental study documenting the spread of the disease, a map detailing its spread, an interview with Dr Murnane, and assorted historical documents. Long Riders Guild Academic FoundationEquestrian investigative journalist Tom Moates will soon have a piece published in Equus magazine dealing with the US outbreak. Thanks for a very interesting historical feature. Would love to read more like this. No doubt this spurred the early development of bicycles and automobiles.